If you have missed me, I’ve missed you, too, but it’s just been too hot to be in the kitchen this summer. El Día de la Independencia, September 16, brought me back from the brink of forgetting that I even have a food blog. Chiles en nogada, the traditional dish served for Mexican Independence Day, helped reacquaint me with mi cocina mexicana. A year ago, I featured Chiles en Nogada the way they are traditionally made in Mexico — with dried fruit. For something different, this recipe features fresh fruit instead of dried, with a golden delicious apple and a sweet, juicy peach. I think plums and pears would be great in this, also. With all the beautiful fruit in the markets this month, the possibilities are endless. My taster-in-residence says these chiles en nogada are delicious, but for a real test, he would need to taste them side by side with the dried fruit version. At least that’s what I think he said between mouthfuls of stuffed poblano. His sly smile means he really wants me to make more, with either dried or fresh fruit. He’s not particular. Chiles en nogada are usually garnished with pomegranate seeds, something hard to come by in our little town. I substituted an unusual fruit, Natal plum (Carissa macrocarpa), that grows in our yard. Its color replicates the pomegranate seeds, but its flavor resembles a sweet cranberry. If you are in La Cruz de Huanacaxtle and walk along the Marina Riviera Nayarit, you will see hundreds of Natal plum bushes lining the walk-way, bright with aromatic white flours and red, little plum-like fruit. The word nogada is Spanish for “sauce of pounded walnuts”, according to Cassell’s Spanish Dictionary. The creamy, white walnut sauce adds a mellowness all of its own. Don’t bother trying to peel the walnuts, as many recipes recommend. It is too tedious a chore and really not necessary. Roast and peel poblano chiles. Carefully slit down center and remove seeds, keeping chile intact. Set aside. Roast and peel tomatoes. Squeeze out juice, reserving the liquid. Finely chop tomatoes. Set aside. Add ground meat and cook until no longer pink. Add tomatoes, 1/4 cup walnuts (or almonds), fruit, bay leaves, cinnamon, oregano, salt and pepper and simmer for ten minutes. Do not allow to cook dry. Add reserved tomato juice or water to maintain some moisture if needed. Remove bay leaves. To make the sauce, combine crema or sour cream and 3/4 cups walnuts in blender until smooth. Add a little milk if it is too thick. Salt to taste. Generously fill chiles with meat mixture, spoon walnut sauce over top, and garnish with pomegranate seeds or any red colored fruit, chopped. Mole Verde con Pollo marks a milestone for me, as I have never had a recipe for chicken on this blog before, and I have not eaten chicken in over ten years. Until now. I could not bring myself to eat anything that had been raised in cramped cages, denied sunshine and fed who knows what. A local reader, knowing of my chicken hang-up, told me that the same store where I buy range-fed beef also carries chickens from a local ranch. Several years ago, when I asked about chicken at this store, they could not tell me it was supplied locally. It seems things have changed, so chicken is back on our menu. Russ is glad. With fortuitous timing, another reader, Cecil, sent me her grandmother’s recipe for Mole Verde con Pollo. Compared to most, this mole (MOH-lay, with an accent on the first syllable), is easy to make, having fewer ingredients, and it has a lighter taste. The dark moles can be heavy. This is not to say they aren’t wonderful, but they are fairly intense. 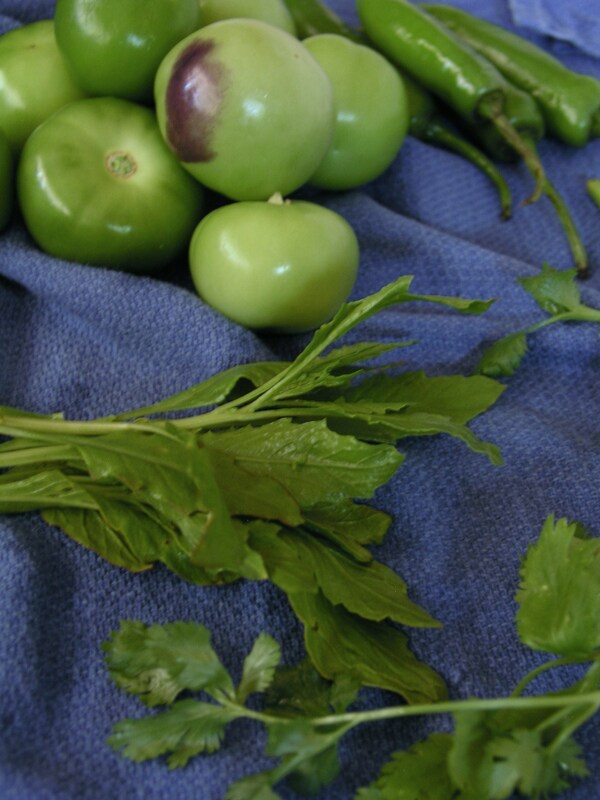 Mole verde is less spicy but with its own notes of pumpkin seeds, tomatillos and epazote. Russ says he’ll eat it as often as I make it. There are many different types of moles, spanning a rainbow of colors: yellow, red, black, green, plus pipián and almendrado. They all contain chiles, but they don’t all use chocolate. Mole Poblano, a dark mole from Puebla, does include chocolate. Mole Verde does not. I think you will like how easy it is to prepare and its fresh, light flavor. 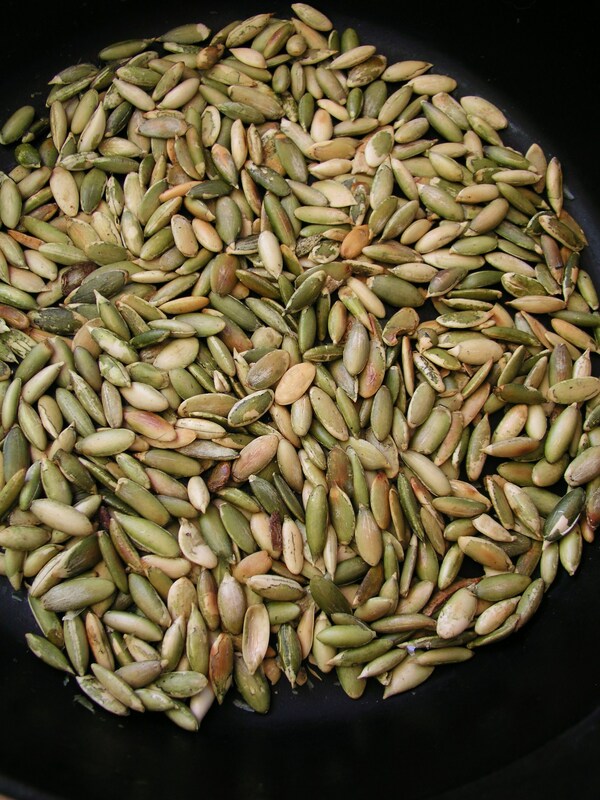 It’s what we are having for Cinco de Mayo, an almost non-event in Mexico, but celebrated big time by the grocery stores in the U.S.
Pumpkin seeds — pepitas — are a common snack in Mexico. You can buy them raw or already toasted and salted. What we think of as pumpkins in the U.S. and Canada are seldom seen in Mexico. (And that means no jack-o’-lanterns at Halloween in Mexico, either.) Pepitas are really squash seeds. For this recipe, start with raw seeds, pepitas or pumpkin seeds, and toast them lightly until just starting to brown. Unless you are all fired up about using your molcajete, pulverize the cooled, toasted pumpkin seeds in a coffee grinder. Wipe out any coffee residue first. Or better yet, keep a coffee grinder dedicated to spice and seed grinding. In a medium sized pot, simmer tomatillos, onion, garlic, serranos and 2 cups of chicken broth for 5 minutes, or until the tomatillos are soft. Add ground pumpkin seeds, cilantro and epazote and puree again until smooth, stirring seeds into mixture if necessary. Heat vegetable oil in a large pot. Pour blender contents into the pot while stirring, and stir in remaining one cup of broth. Simmer for 30 minutes, stirring occasionally to prevent burning on the bottom. Salt to taste. Ladle a generous spoonful of mole into soup bowls, add a piece of cooked chicken, and spoon more mole over chicken. Last week when I wrote about, and made, Torta de Garbanzo, many of you must have wondered what in the world I was foisting on you. A bean torte? Sweetened garbanzo beans with cajeta? Yet, you gamely read on, some of you even writing that you wanted to make this unusual Mexican Lenten dish. The torta recipe called for natas, cooked, thickened cream, which I didn’t have, and I’ll admit, didn’t know much about. I substituted evaporated milk, but Leslie of The Mija Chronicles, a wonderful Mexican food blog, wondered if I would make natas and write about it. OK, Leslie. You have made your share of interesting, unheard-of-before recipes for us, so I’ll gamely take my turn, instead of waiting for you to make it first. My Cassell’s Spanish Dictionary defines nata as “cream, the main part of a thing, the prime part”. Diana Kennedy, British by birth, writes in From My Mexican Kitchen, that natas are the same as clotted cream, so beloved with cream tea in England where it is spread on scones. Now we are getting somewhere. In my youth, when my family lived in England, we had cream tea. I was too young to know, or care, that it was clotted cream we were gobbling up. I just knew it was rich and delicious, and could I have more, please? There isn’t much in my Mexican cookbooks about making natas, so I went to my friend Guillermina and my neighbor Lupita, both excellent cooks, to ask about their method. They gave the same instructions: slowly bring whole raw milk just to a boil over low heat, turn off the heat, let the milk reach room temperature, refrigerate until cool, then skim off the thick cream that has clotted on the surface. This thick, skimmed fat, the cooked cream, are the natas. But Guillermina knew the easy way. She opened her fridge and showed me a carton of natas she had just brought home from Mega supermercado. If I hadn’t had two gallons of milk crying to be used up, I would have considered the easy way, too. But then I would I have lost my bragging rights about making natas, if it is anything to brag about. After skimming the clotted cream, two gallons of raw milk yielded one cup of natas. What could I do with it, except make Torta de Garbanzo again, the way it should have been made in the first place, using natas instead of evaporated milk. This torta was wonderfully smooth, creamy and rich. Evaporated milk will do in a pinch, but for an authentic torta, you need natas. We’ll be in front of the TV Sunday watching the Super Bowl, like many of our expat friends. And just like them, we’ll be munching on botanas, Mexican snacks. I don’t think I’ll get it together to make pizza, but I have a few things in mind fellow bloggers have made recently that I want to try. 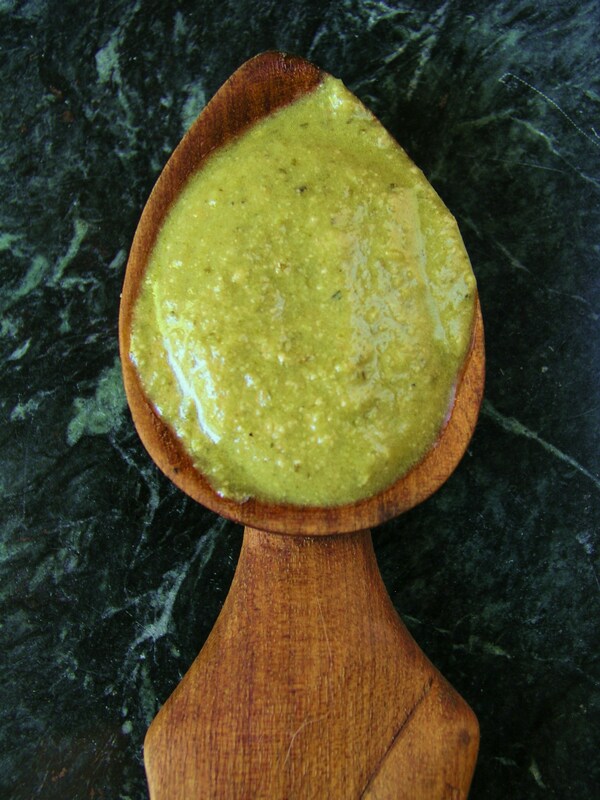 Lesley Téllez made an interesting, creamy Mexican pumpkin seed dip, called Sikil Pak on her blog, The Mija Chronicles. With just six ingredients, counting the salt, it looks pretty easy to make in a food processor if you don’t have your metate handy. Sikil Pak, you say? Sikil is Mayan for tomato; pak means pumpkin seeds, also called pepitas in Spanish. The Mayans have been eating this for centuries, maybe while watching their ball game, pok-a-tok, which took a more serious turn than football ever does. The loser was sacrificed to the gods. Muy Bueno Cookbook just wrote up an easy mix for Michalada. With only four ingredients, counting ice, beer, lime juice and salt (I just gave away the recipe, didn’t I), I can’t think of anything more refreshing drink to wash down the tostadas. Lyndsey at The Tiny Skillet is making Mexican Fried Cheese with queso de freier. This was to me. How have I lived in Mexico so long and never heard queso de freir? I’m off to find some, and try frying cheese. She suggests serving it with a salsa. My recipe for salsa de chile guajillo or chile ancho would go well with this. The tostadas are for my favorite guacamole. It has ten ingredients, and that counts the tostadas –corn tortilla chips — on the side. You can make it in fifteen minutes, easy. It differs a little from most guacamoles. Some of the avocado is cubed to give a creamy bite to the mixture. If you want to see another version of guacamole, check out this hilarious guacamole song on YouTube, complete with a recipe, by two dubious looking mexicanos with strange mustaches. I might come up with a few other dishes, but this is a start. We won’t be sending out for pizza.